We’d love your help. 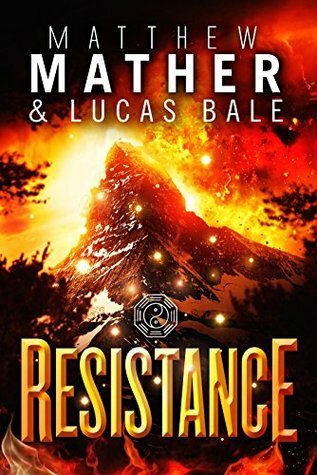 Let us know what’s wrong with this preview of Resistance by Matthew Mather. This series keeps getting better as it goes along. The story has momentum and drive forward that kept me turning pages. I never know what insidious plot will be uncovered by Jessica and her band of refugees or if they will survive the next ecological disaster. The third book in the Nomad series. To me this book was a real snoozer. These people ended up in Sanctuary but that was short lived since someone blew it up. Then they were right back where they started from. Once they got to Africa or wherever they ended up I lost all interest in the storyline. It just went on and on and it was so boring that I scanned it to the end and that was that. Whew....what a disappointment. Glad I got that over with. I really liked Nomad. I was really underwhelmed with Sanctuary. I'm also pretty underwhelmed with this. Jess is just so annoying. Ufuk is needlessly dodgy. Who knows what the story with Massarah is. It just seeems needlessly...young teen. I liked the science in Nomad...that aspect is why I really liked it. Sanctuary was boring and light on science. This one starts to pick up on a scientific thread again. It's a little outdated (thanks to Cassini) but on the right track. I'll finish the series, but I really liked Nomad. I was really underwhelmed with Sanctuary. I'm also pretty underwhelmed with this. Jess is just so annoying. Ufuk is needlessly dodgy. Who knows what the story with Massarah is. It just seeems needlessly...young teen. The story continued apace. The action sequences were stimulating, but the story provided little additional insight into several key characters' motivations. The clockwork parts of the plot are turning, but what the final outcome will be is yet to be seen (setup for the next installment). This volume had a few more minor grammatical errors than the last, and repeated a couple of technical errors that also appeared in the second volume. Hint: jet fuel is basically kerosene with additives, is not "h The story continued apace. The action sequences were stimulating, but the story provided little additional insight into several key characters' motivations. The clockwork parts of the plot are turning, but what the final outcome will be is yet to be seen (setup for the next installment). More twists and turns than you favorite roller coaster! The continuing story of New Earth plays out like a shell game -- where is the pea? Who has the answers? Who can you trust? Will we ever learn why Mueller needs Jess so badly! ...sorry. No spoilers here. Read this book! This unique story of post-apocalypse Earth gets more intriguing with each installment. It combines hard SF, espionage, global politics, cultural clashes, astro-physics, and manned space flight in ways that keep me guessing. Great character development keeps me caring about Jess and her charges as they struggle through a world changed forever by a cosmic event. READ IT! My main problem with this Book Series is that it implies it is SciFi — and it is NOT. It’s just one continuous story, centered about a woman and those closest to her, improbably surviving in an Earth that’s been torn apart. The ‘good’ guys and the ‘bad’ guys change hats at the author’s whim, and the overall scenarios are just not believable. I didn't like this book as well as the first two in the series. The pace was very uneven - several places where the story seemed to drag on and on. Had those slow spots been tightened up, I would have given this 4 or 5 stars, because when the pace was good, it was very good. Overall I still like the series and am looking forward to reading the 4th book when it comes out in the next couple of weeks. Resistance is the third book in the Nomad Series! Resistance begins with Jessica, Giovanni, Hector, Raffa, Lucia, and Roger in Sanctuary Europe. Ufuk came to Jessica rescue but she's not sure he can be trusted. I love Matthew Mathers writing and I have soared through the last 3 books. I can not wait to start on Destiny. In the same action-packed style as the first two books in The New Earth series, Resistance drives the story forward, while at the same time still leaving you searching for answers. A new story line appears already from the prologue, that of the Mars First mission, but it doesn't bring yet much to the story. If you enjoyed the first two books, you'll probably enjoy this one as well. The pace, character development adventure and creativity is continued here. Jess Gio v ani & co continue through life after the devastation of Nomad. This is block buster reading. Thoroughly recommended. Great read..never a dull moment...twists and turns everywhere...kept me reading until way past my bedtime! Another hard to put down book in the Nomad series. This opens with a whole new plot line, but does take a few pages to painlessly recap the previous books. And it ends with another cliffhanger. This review has been hidden because it contains spoilers. To view it, click here. Started reading this with Book 1 Nomad and wanted to see how it ended. I have to say that the main character Jessica Rollins seems to cause her own problems. By the time I got to this last book, she became exhausting! Glad the saga ended!! The main character is now so annoying that I really want to kill kill her just to get it over with. I have no idea how her companions put up with her, especially without ever saying I f*#@king told you so! Like the story line. Not too fond of the main character. Hard to swallow someone so out of control can be in so much control. A few hints to her importance would have been helpful. Hope Destiny is more to my liking. Entertaining read. Sometime I'd like to smack Jessica but maybe she'll straighten up in the next book. The next book is already in my queue for tonight. Great continuation of this post-apocalyptic saga. The mysteries and intrigue continue. I've flown through this series, the earth is safe, is not. Jessica and crew is safe, they're not, who can she trust? Probably the best one of the series so far. I do want to see how this series ends but I just can't get over the fact I hate the main character - Jess. I'd probably give if 4 stars if she'd die. Good follow up on other books in the series. Love the different twists and turns. Can’t wait to see where this ends up. I enjoy this series, but it isn't enough to keep me from wanting to put down. It's something I may pick up when I get bored, or have nothing better to do. I thought this book was going to get better. It isn't a thriller nor a apocalyptic book. It is a mystery because I have no idea what the plot is. Excellent read. Plans within plans. A possible destiny a possible end. Good mystery of an unforgivable future. It's too real to ignore. A solid sequel and better than the last one in the series.